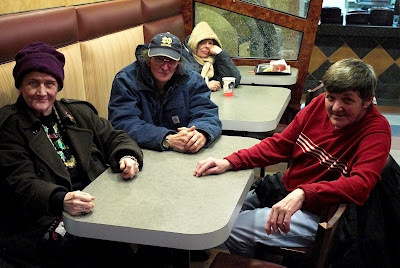 These folks (Margie ,Lee, Tom and Betty ) are sitting in the McDonalds located on 1st avenue between 6th and 7th street . They gather here frequently with , at times , perhaps 5 times their number in friends and neighbors to have some coffee and snacks while socializing . They gather at this fast food restaurant because all the places that they once frequented have been replaced ... mostly by boutiques , bars , cafes and up-scale restaurants . Todays new neighborhood establishments are too expensive for them and for that matter do not even want them as patrons . These people are real New Yorkers . Unlike some at the very top of the Bloomberg administration , they have spent their lives in their New York City neighborhood , in this case the East Village . Among them and their friends some can even be found that have families that have been in the neighborhood for several generations . They have all had to watch and endure as their friends have been displaced and their community replaced by fashionably expensive residential developements as well as by new fashionable entertainment industry establishments . All this change has been abetted by the Bloomberg administration's exuberant and uncritical support of the numerous and often less-than-scrupulous developers that have been the immediate effectors of all of this change . The Bloomberg administration argues aggressively and repeatedly that this opportunity to change a-new our city is a god-send and that doing so is good for everyone including Margie , Lee , Tom , Betty and their friends and neighbors : the replacement of the old by the new is a good thing , it is progress you know . So now that the neighborhood has become for the whole world mere property to purchase , now that the neighborhood has become a playground for a horde of NYU students , now that the neighborhood has become a destination for an ever larger week end out-of-town horde seeking entertainment : gustatory and drunken pleasures .... Mr Mayor come down to McDonalds and help Margie , Lee , Tom , Betty and their friends to understand why and how all this change is good for them .... and perhaps Mr. Mayor while you are with them you could also for once listen to them ...these concerned , humble , good-spirited neighborhood folks that they are , that read the papers , are very up-to speed on current neighborhood affairs and indeed eagerly and knowledgeably discuss among themselves these affairs ... perhaps you can learn something about real New Yorkers and real New York neighborhoods and the disaster that your administration has been for them . 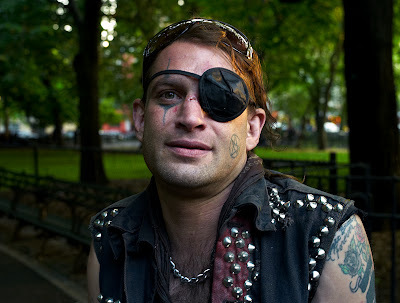 On a rare day last summer in Tompkins Square Park we see L.E.S. Jewels above , whom we have posted of here at NMNL for a year-and-a-half now , relaxed and sober . Today Jewels is likely sober but he is not in TSP and perhaps not so relaxed . 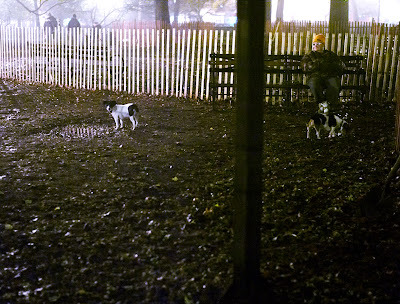 He is on Riker's Island having been sentenced to a year of relatively easy city time . Jewels pleaded to the charges of attempted robbery , assault and assault with a weapon , a cane . Somehow he avoided a more difficult and lengthy stay in a state prison up-state . With this year-long sentence he will be back on the street at the latest by next July and at the earliest late April of 2008 . So will he get it together and work towards a worthy life ... or should we put together the betting pools now and start taking odds on when he will first be on a drunken rampage in TSP , his first public urination or perhaps the date of his first mooning of a cop car ... or whatever ?